On January 5th 2017, Kodak announced plans to bring back one of the most iconic slide films, Ektachrome, by the end of 2017. Kodak discontinued Ektachrome in 2012 and hasn’t produced any slide film since. The decision to bring back slides is one of its most surprising and exciting moves by Kodak in years. Photographers are ecstatic. Celebrations have erupted across the Internet. The announcement comes at a moment of renewed interest in slide film in general. Professional and lay photographers alike are rediscovering its charms. Why so much enthusiasm? Photographers who love slides love slides. The combination of nostalgia and a unique way of capturing color and light has earned slides a special place in the photographic landscape. By bringing back the most iconic of the slide film brands, Kodak is breathing new life into the trend and expanding options available to fans. Today, most slide film is produced by Fuji (Provia and Velvia) with smaller manufacturers, such as Rollei and Lomography, contributing a few alternatives. The reintroduction of Ektachrome expands the art of the possible for slide photographers. The most common reason that photographers continue to use slide film is simple: beautiful photos. Slide film lends itself to bright, saturated colors and high contrast, making photos “pop” in a unique way. 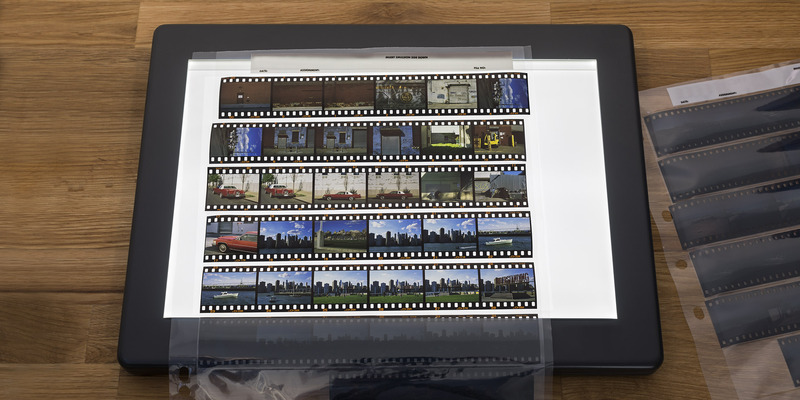 Unlike negative film, which requires scanning or printing to become an image, developed slide film is the final product. The image is revealed on the film itself. The advantages? Among the most important: you can quickly and easily review and sort photos. If you’re like me and develop large batches of film at a time, you’ll likely enjoy the efficiency and control that comes with slide film. With a simple light table or projector, you can dive right in – no scanning or printing required – and work through your photos. Once you decide to scan or print your photos, you can reference your slides to match colors and quality. Let’s be honest, no one is clamoring to bring back those dull family photo projection sessions of yesteryear. But slides offer several interesting display options for artists. Slide film is perfect for prints. The film has low – almost no – visible grain, even when scanned at high resolution (4,000 dpi). That means it’s made for enlargements. Many photographers use it for subjects that require high resolution prints, such as landscapes or fashion photos. On the photography side, it’s important to know that film slide is much less forgiving than negative film. You need to get your exposure spot-on to avoid black shadows and burnt highlights. Slide film has up to 1 stop range, compared to 3 for color film and 6 for black & white. For important photos, I recommend “bracketing” by taking multiple shots at different exposures. Keep in mind that, because the final result is your slide, you will not be able to correct the exposure before projecting. Finally, slide film is currently only available in 100 ISO or less, without the higher options available in negative film. I highly recommend experimenting with slide film. It’s great for colorful subjects and bright settings. While I turn to black & white negative film for street photography on a rainy day in Paris, slide film is one of my go-to’s on a sunny summer day in New York. These days, you can great color saturation, high contrast, and high quality grain from negative film, especially the latest generation of Kodak Ektar. But, there is still something special about the way slide photos “pop” – in raw film format, printed, or projected – making them timeless, in a way. Give it a try and post your photos and observations below! Slide film is absolutely fantastic! The detail and vibrant color are unmatched. We process, scan, and print E6 slide film of all sizes at Lone Star Darkroom in Dallas, TX (www.lonestardarkroom.com) and are seeing more and more people take advantage of the quality slide film brings with it. In US, you are very lucky to have labs that develop E6! In Sweden we don’t…. I believe the last lab just discontinued its E6 development service. BUT, I recommend you all who have the same situation to develop E6 and C41 yourself at home. I have done it for years and it’s easier than you think!